Last month I gave a presentation on building a marketing technology platform. A few people have been in touch to share their ideas around customer engagement platforms and marketing automation. It comes as no surprise that there are numerous marketing technology platforms already in use today. But where are they and how are they being used? What is a marketing technology platform? Marketing technology are tools that make life simpler for marketers to market. They automate difficult, time-consuming and repetitive manual tasks to surface customer insight. Built by technologists, used by marketers. Marketing technology should aim to remove or significantly reduce the need for IT involvement. In short, to keep marketing in marketing. Technology used by marketers to facilitate customer online journeys. What kinds of marketing technology are out there? There are SEO tools for evaluating sites pages, writing SEO friendly copy and performing realtime keyword research. And even more niche acquisition-based technology to support affiliate marketing, PPC, online ads and sponsorship. Then you have applications that aid in content creation, landing page optimisation, merchandising, usability and analytics. Not to mention retention and growth tools that focus on personalisation, loyalty programmes, email marketing and customer management. Today, we are marketing technology rich. Note: the above is by no means complete. The key difference between marketing technology and a marketing technology platform is largely the level of IT involvement marketersneed to market. If for every marketing activity the marketer needs to run a project that requires high levels of IT planning, resourcing and custom build, that is not a platform for marketers. It is not a marketing technology platform. It is just a collection of tool(s). Consider a content management system (CMS) that is installed to enable marketers to manage their campaign and promotional content. Worst case is that they have a content managed web-site that’s jointly operated by IT and the business. At best they have the tools to rapidly make site changes and tinker with SEO and analytic tags embedded within the content. In neither case is the marketer able to easily build out an integrated campaign and monitor its progress. That’s because the CMS is just one piece, albeit an important piece, of the marketing technology solution. A marketing technology platform harnesses technology to put marketing functionality in the hands of marketers and/or marketing technologists. It integrates many different marketing technologies into a consistent and cohesive whole. This enables marketers to create, manage and monitor their digital campaigns from beginning to end. The platform combines data and technology to provide a unified and comprehensive set of digital marketing capabilities. Unbounce is a landing page platform. It’s full service and does everything in and around landing page management. No IT required. Unbounce is a marketing technology platform. MailChimp is another example. The rise in popularity of MailChimp can be largely attributed to its ease of use for performing email tasks. Again, little or no IT knowledge required. Both Unbounce and MailChimp are marketing technology platforms for marketers. For smaller organisations, knitting together these platforms with other technologies enables marketing departments to cost effectively automate the email and landing page aspects of their digital campaigns. However, larger organisations that have multiple product teams, business units and internal audiences, a smorgasbord of marketing technologies does not sit well with the centralised services mindset that is IT. CMOs and CIOs are just not aligned on that front and the jury is still out on whether they ever will be. However, when running hundreds of digital campaigns, promotions and events, there are real benefits to managing them across a single platform. This is when the notion of an in-house marketing technology platform starts to take shape. How do you reconcile customer (CRM) and product (eCommerce) information? What’s the best way to measure and monitor marketing activities, across all channels, in a consistent manner? What technology infrastructure do we build to support mobile, email and social media channel integration? How do you structure and manage content that needs to be translated, localised and personalised in unforeseen ways? How do authors create campaigns in one place and publishes it along multiple marketing channels? What the best way to plan, manage, schedule and rollback complex, integrated digital campaigns? How do you integrate with anything and aggregate everything? How will the platform scale to support a global business? The in-house marketing technology platform provides a joined up marketing technology strategy. It takes a best of breed approach to reuse marketing technology that is already out there and successful. There are definitely core pieces of the platform that require the deep thinking. These pieces relate to the messaging backbone, CMS, Analytics, eCommerce and CRM. However, once the essential core is understood, its a matter of defining the best practices and recommendations for integrating with other marketing technologies to ensure the reliable flow of ‘A’ class data between marketing and their customers. There are many ways to achieve / approach the above. How have you done it? 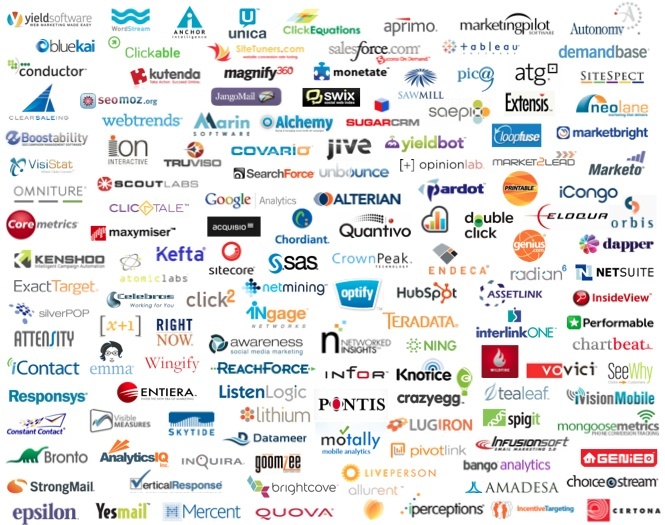 What does your marketing technology platform look like today?